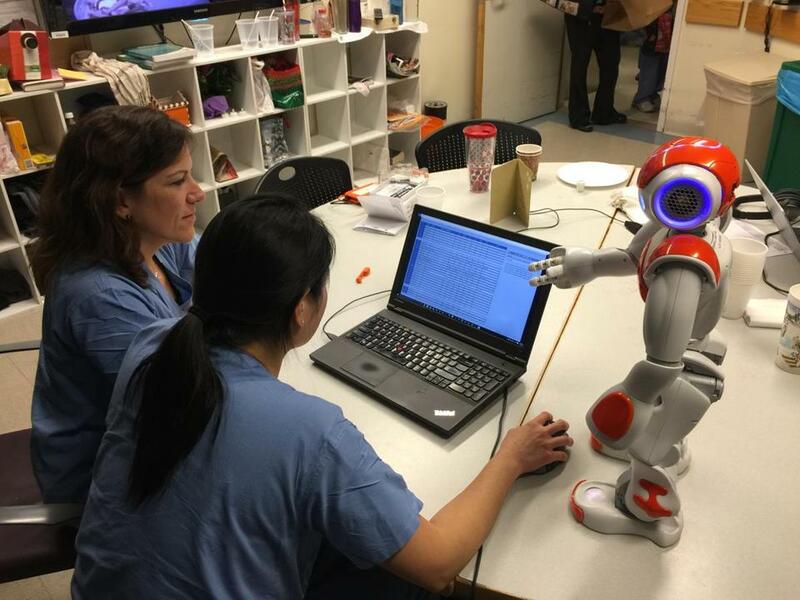 Beth Israel Deaconess Medical Center employees worked on a project to allow a robot to function as nurse manager. 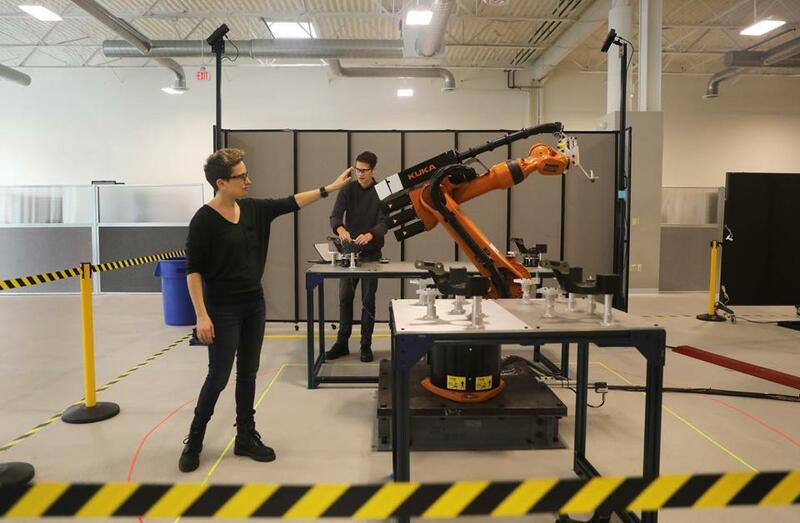 In Waltham, engineers are building a system that allows workers to stop a one-ton industrial robot with the wave of an arm. At a Boston-area hospital, an MIT-trained robot has learned to function as a nurse manager of sorts, making workflow suggestions in real time. Other robots developed around the region can ask questions, identify and pick up thousands of different objects, even anticipate a person’s movements. Robots have long been seen as a futuristic threat that will take our jobs. But many of us will increasingly be working alongside them, rather than being replaced by them, a dynamic that several Boston-area companies are advancing with collaborative robots that can take over routine tasks, such as assembly, heavy lifting, and number-crunching. This shift will inevitably shake up the labor force, but it could also elevate people into higher-level, uniquely human roles that require creativity, emotional intelligence, and leadership. In other words, it’s time to stop fearing that robots are going to replace us and start learning how to get along with them as co-workers. The predictions are daunting. By 2025, machines will carry out more than half of workplace tasks, according to the World Economic Forum, compared to 29 percent done by machines today. And as more lower-skilled jobs are automated, the most vulnerable workers are likely to suffer the most, either losing their jobs or facing lower wages as more employers have the choice to use a robot instead. But the rise of the machines is also expected to spark positive change. While roughly 75 million jobs will be lost worldwide because of technology, according to the World Economic Forum, 133 million new jobs will be created. In Massachusetts, one of the country’s original manufacturing hubs, more than 300 robotics and robotics-related companies have sprung up, according to the Mass Technology Leadership Council, roughly half of them in the past eight years. In many industries, such as manufacturing, the robot invasion is in full swing. For now, many of these heavy-duty industrial robots are caged, to prevent a human from getting too close. But by 2025, collaborative robots, or “cobots,” as they are sometimes called, are expected to make up more than a third of all robot sales. One major hurdle: making sure humans can work safely alongside them. Some workers are already benefiting from collaborative robots. Among them: a young woman at Eckhart, which uses Humatics technology, whose previous job inspecting autonomous vehicles is now being handled by a machine. She became a lab tech in the 3-D printing lab, which came with a raise, as well as the opportunity to learn from engineers and move up. At Veo Robotics in Waltham, roboticists are also creating technology that will allow people to work next to robots — and make adjustments if they get too close. During a demonstration in the firm’s warehouse-like space, a robot lifted a 30-pound steering knuckle — an automotive part that attaches to a wheel — and placed it on an assembly station near an engineer, who bolted it to another part. Three-dimensional cameras tracked them both, using a set of algorithms to predict where and how fast the human would move, which dictated where and how fast the robot would move. If the engineer got within about four feet, the robot slowed down; if he got within three feet, it stopped. These “cage-free” robots can cut the time it takes to do a task in half, said Clara Vu, Veo’s vice president of engineering, and take over the sort of laborious, repetitive tasks that can injure people. Clara Vu, of Veo Robotics Inc. in Waltham, showed how industrial robots can work with people. At rear is engineer Paul Schroeder. Even warehouse robots are learning to share space with human co-workers. The company 6 River Systems, located down the street from Veo Robotics, has created a shopping-cart-size robot, named Chuck, that helps workers find merchandise in a warehouse. Chuck groups orders by location, then leads workers to the right aisle, displays a picture of the item, points to its precise location, and scans it to make sure the worker retrieved the correct item. All of this makes the process more efficient — reducing the number of miles that warehouse workers walk in a day by an estimated 66 percent — and it also makes workers job-ready on day one, even if they don’t speak English, said vice president of marketing Fergal Glynn. Technology has been displacing workers since the Industrial Revolution, said Stefanie Tellex, a computer science professor at Brown University who is developing robots that can respond to voice commands and learn from mistakes. And although robots that improve manufacturing could potentially bring work back to the United States, Tellex said, she is well aware of the disruption they will cause. “I think it’s incumbent on us as a society, it’s a political and societal question, how are we going to mitigate these effects?” she said. As robots acquire more basic skills, they will inevitably raise the bar for entry-level jobs, forcing people to acquire more advanced skills such as those that involve problem-solving, said Willy Shih, a Harvard Business School professor. “The jobs of the future are not going to be putting tops on bottoms. They are going to be ‘Robot, stop, I need to change the tool,’ ” Shih said. Joseph Aoun, the president of Northeastern University, believes it’s essential that higher education prepare people for this change. In his 2017 book “Robot-Proof: Higher Education in the Age of Artificial Intelligence,” Aoun writes about the need to train creators instead of laborers, to foster people’s ability to innovate and empathize. What we shouldn’t do, he said, is focus on data processing or other tasks that machines can master. “If we compete with machines on their terms . . . we lose,” he said. Julie Shah, a roboticist at MIT, spent several years teaching a machine to manage the workflow on a labor and delivery floor. One of her graduate students shadowed doctors and nurses at Beth Israel Deaconess Medical Center — where Shah’s husband is an obstetrician — then programmed the machine with this information and created a simulator that allowed it to learn which decisions produced the best outcomes. Shah then installed the artificial intelligence system on a robot and, in the fall of 2015, brought it to the hospital, where the robot made suggestions about giving breaks and assigning nurses to patients in real time. By and large, the medical staff on duty agreed with the robot. But sometimes, said nurse Kristen Jerrier, “the decision that makes the most sense on paper is not the right one.” If a nurse had just participated in an especially emotional delivery, Jerrier said, a human could tell if she needed a break, but a machine couldn’t. And that’s exactly the point, Shah said.